In the previous classes we had studied an object called cuboid which has three dimensions namely length, breadth and height. Is there a relationship between the numbers 1, 8, 27, 64… and 1, 2, 3, 4… ? They are numbers obtained by multiplying the same number thrice from the 2nd set of numbers. Cube numbers are integers raised to the power of 3. They are of the form n3. So 1,2,3,4 are cube roots of the numbers 1, 8, 27, 64 respectively. Definition: Any number which is a product of three identical numbers is called ‘cube’. The volume of a solid figure of three dimension=length*breadth*depth(we learn this in Geometry). 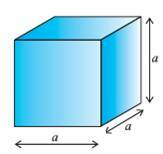 Cube is a solid figure whose length, breadth and depths are same. In this method we find all prime factors of the given number and then group the common factors in triples, such that all two factors in each pair are the same. If some factors do not appear in triples then the number is not a perfect cube and we stop the process of grouping. 1.3.1 Problem 2: Find the least number by which 432 must be multiplied or divided to make it a perfect cube. We note that the factor 4 appears only 2 times. 2. If we divide 432 by 16 we get 432/16= 33, so when the smallest number 16 divides 432, it gives us the cube number (=27 = 33). 1.3.1 Problem 3: If 1 cubic cc of water weighs 1 gram, what is the weight of 1 cubic meter of water?